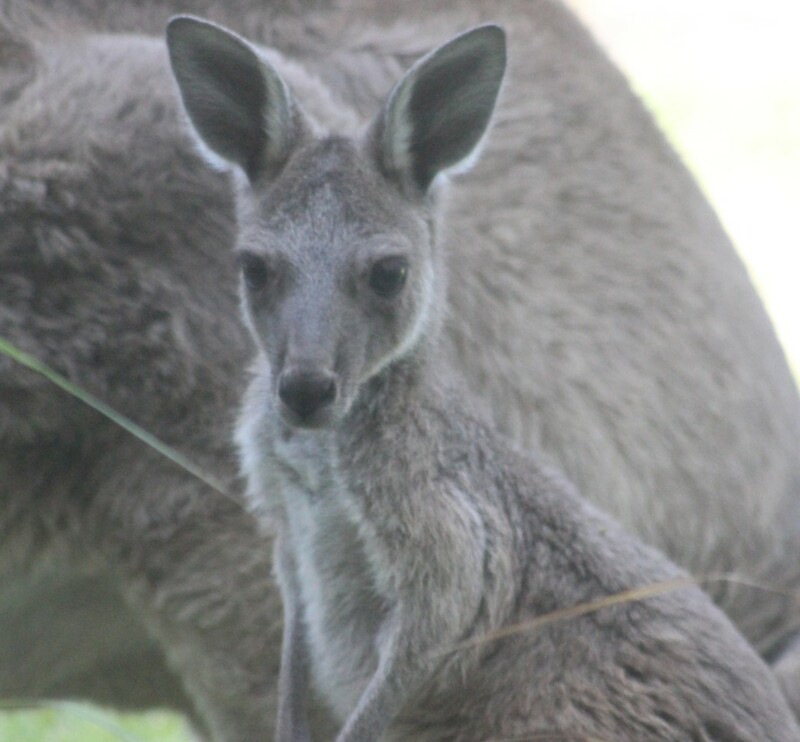 At the risk of being boring and sounding like a broken record – we have a resident mob of Kangaroos nearby. He’s a Western Grey Kangaroo who stands, when he decides to straighten up, at just over seven foot tall. He has front paws like dinner plates and claws like… well like big claws really. He also boasts an impressive set of… ears, amongst other things. There isn’t really a male near his size so it would seem that he should have his complete pick of the ‘Ladies’. But Boomer is besotted. The object of his desire is a particular doe and her (and presumably Boomer’s) offspring. We’ve decided to call her Bambi’s Mother, just because her head at certain angles looks deer-like. Wherever she goes, Boomer follows. He lies where he can see her, bounds after her when she moves on to fresh grass, straightens up and moves to be beside her at the slightest hint of danger. He even keeps a watchful eye out for the Joey (who we’ve called Bambi for now). We’ve observed this constant companionship for at least six months now. So, my question is simply, does anyone know if this is “normal” behaviour for a dominant male in a mob? Is it usual for him to choose a particular doe to spend all his time with? Can a Kangaroo have a favourite and be in a… I hesitate to call it a relationship, but a preferred partnership? If you know, drop me a comment or mail me. If you don’t then that’s okay. Have a final set of pictures of our Boomer and his family (clicking on them will bring them up in full size).